Thank you for your interest in the Symposium on Probabilistic Modeling in Science and Engineering at Lehigh University! Given the increasing interest of applied science and engineering towards the random aspect of physical phenomena, the Probabilistic Modeling Group at Lehigh University invites you to this symposium, to accelerate the transition to a world where probabilistic modeling will be a fundamental skill for all scientists and engineers. THE SYMPOSIUM WAS HELD ON OCTOBER 25, 2016. The 2016 symposium had the objective of gathering researchers expert in theoretical and applied probability to share their experiences in different fields of science and engineering. The symposium had also the scope of promoting the probabilistic approach as one of the pillars of scientific curricula for undergraduate and graduate university programs. 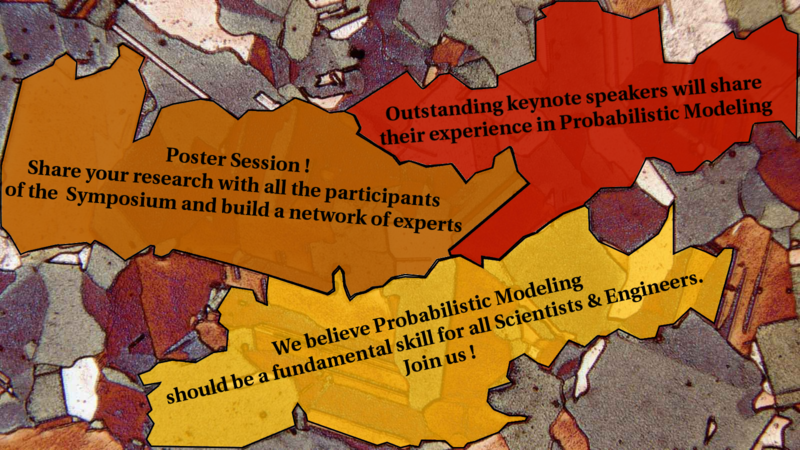 The symposium included three keynote speakers from different scientific fields, but all working on theory and applications of probabilistic modeling. The keynote speakers held a panel discussion on the future of research and education in probability. Lehigh University, through the Office of Research and Sponsored Programs and under the auspices of the Probabilistic Modeling Group, is pioneering this initiative and aims at establishing a network of cooperation among neighbor universities. The organizers are thankful to the keynote speakers and all the participants for their enthusiasm and commitment during the symposium. we also thank all the researchers and students that shared with us their projects and finding during the poster session. After a remarkable career at UC Berkeley, Dr. Armen Der Kiureghian is now President of the American University of Armenia and a member of the US National Academy of Engineering, among many other honors. With his students, who are now in large part leaders in academic and professional institutions worldwide, he has given pivotal contributions to the development and adoption in engineering practice of probabilistic tools for safety and reliability analysis. Dr. Jeffrey Rosenthal is an award-winning Professor in the Department of Statistics at the University of Toronto, where he received his tenure at the record age of 29 for his outstanding scientific accomplishments. His bestselling book for the general public "Struck by Lightning: The Curious World of Probabilities" was published worldwide in sixteen editions and ten languages. Dr. Rosenthal has also dabbled as a computer game programmer, musical performer, and improvisational comedy performer. Dr. Katja Lindenberg is Distinguished Professor of Chemistry at the Department of Chemistry and Biochemistry of the University of California, San Diego. She was Interim Director of the Institute for Nonlinear Science and Chair of the Chemistry and Biochemistry Department at UCSD. She is currently Director at the BioCircuits Institute, and Executive Editor of the journal "Fluctuations and Noise Letters" (World Scientific). Dr. Lindenberg is a world-renowned expert in the field of stochastic processes and statistical mechanics. Please contact us with any questions about the symposium and for many opportunities about educational and research collaboration.